Liquid Proust Teas has provided me with Smoked Breakfast for the purposes of providing an honest review. I first came across Liquid Proust Teas on Instagram shortly after I had posted my first blog entry here on One More Steep. Andrew Richardson, the owner of Liquid Proust Teas, had liked my screenshot and I saw that he was looking for bloggers to review some teas. 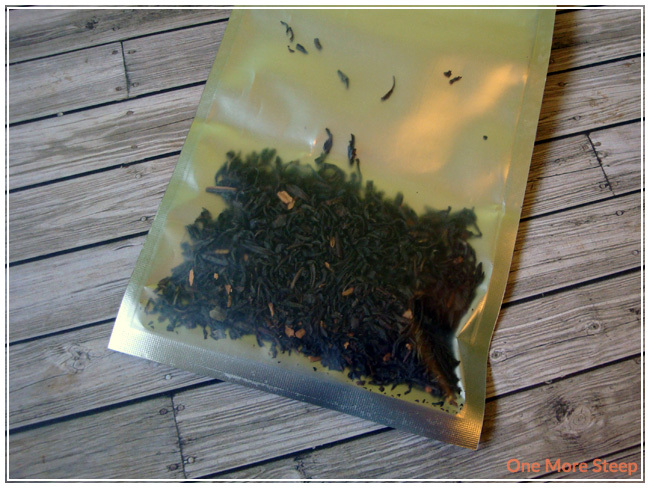 We communicated and a couple weeks later I got a package of tea to review! 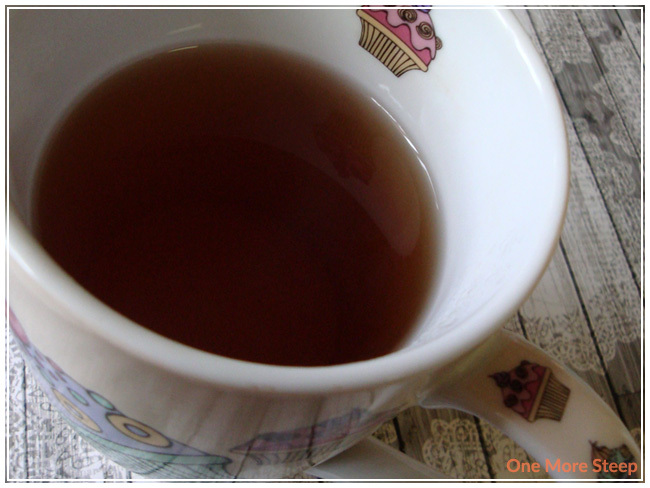 This is the first of four reviews of Liquid Proust Teas. The bag that this sample of Liquid Proust Teas’ Smoked Breakfast came in is very sturdy, I thought I was going to rip the thing apart trying to get it open! But onto the tea… The aroma of smoke is very, very strong and it reminds me a lot of the smell of a campfire. There is an underlying scent that reminds me of star anise, which is not listed on the ingredients list at all. The tea itself is quite nice, I can see a lot of texture in the dried leaves and the leaves themselves are decently sized. Smoked Breakfast contains the following ingredients: Chinese black tea (FOP), lapsang souchong, cinnamon pieces, and flavouring. For those who’ve never had a tea with lapsang souchong before, it is a smoked tea (which accounts for the strong smoke smell). Despite cinnamon being on the list (and being able to see the cinnamon), I can’t smell it at all when the tea is dry. I would have liked it if the ingredients list identified the flavouring as natural or artificial. Liquid Proust Teas recommends steeping Smoked Breakfast in 205°F (96°C) water for just 60 seconds. I thought this was a typo a first, given that black teas are normally steeped for a few minutes, but I did check the Etsy page for this tea and it is not a typo. So I gave it a go at 60 seconds. The tea was steeped for 60 seconds and it still smells smokey although it is not as strong as when the tea was dry, it is a lot more muted now it’s been steeped. I did have to let it cool down a bit as 60 seconds is not a long time to allow water to cool down. To my surprise, Smoked Breakfast is a very smooth tea. It wasn’t bitter and it doesn’t taste smokey. Instead, it tastes a bit sweet. There’s not spiciness that I would have expected from the cinnamon, I can’t taste it all. The tea itself is delightful. The subdued smell of campfire promotes a sense of nostalgia. I opted to try steeping Smoked Breakfast for a second time. This time I steeped it for longer than the initial 60 seconds (probably around 90 seconds). The campfire aroma is still gentle and not over-powering, and the taste of the tea remains true to the first cup. I love it when a tea can be steeped again and taste great! It would probably do very well for a third or even fourth resteep, although I didn’t try it as it was quite late in the day when I had resteeped this tea. I liked Liquid Proust Teas’ Smoked Breakfast. The heavy smoke aroma is very strong and can be off-putting if you’re not prepared for it. I find that the smokey aroma doesn’t transfer into the flavour of the tea itself, and overall it is a very nice tea. I quite like the taste of it and the gentle smoke aroma when the tea is ready to go is quite pleasant. The 60 seconds recommended steeping time was a good call by Liquid Proust Teas, and it did pretty well with the second steeping. 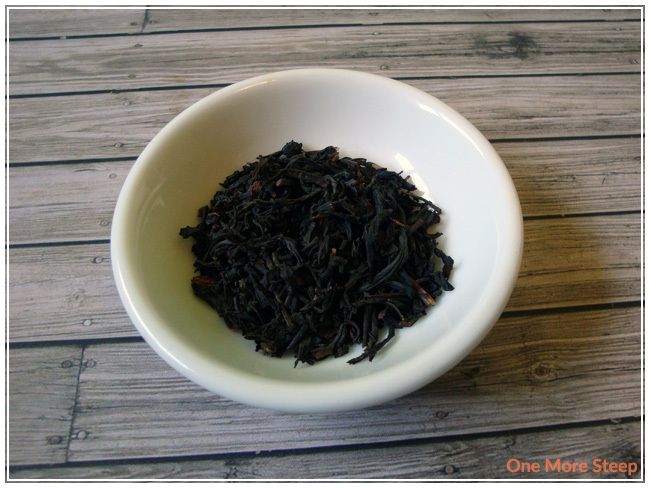 Being able to resteep a tea and have it taste great is a great quality to find in any tea.